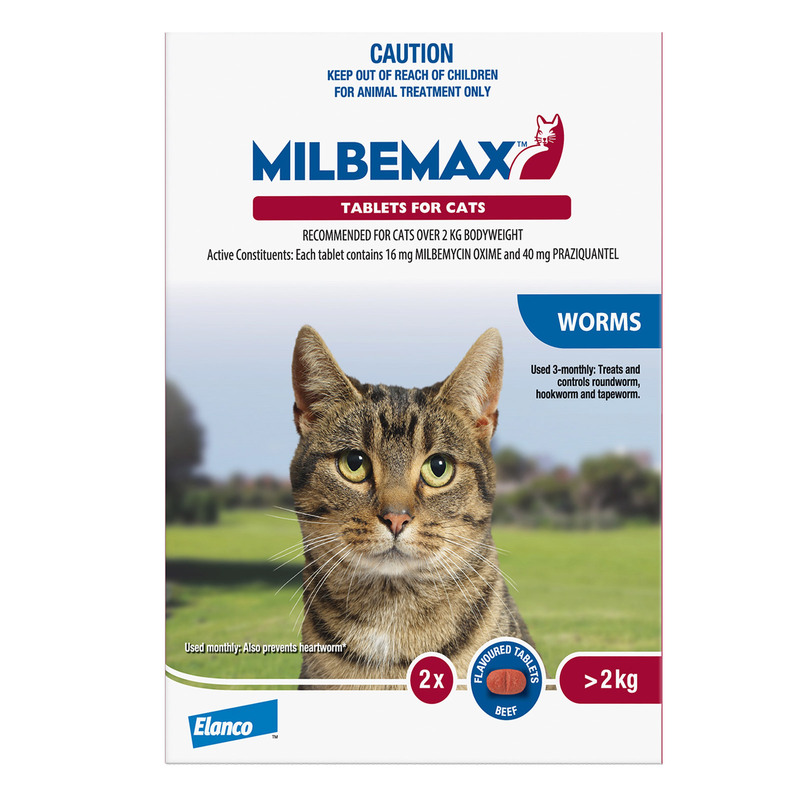 Milbemax for cats is a beef flavored tablet used as a broad spectrum Allwormer to treat intestinal worms in felines. It kills controls and treats all types of roundworms, hookworms and tapeworms found in kittens and cats. It destroys juvenile and mature stages of intestinal worms and thus protects the pet from several diseases. The flavour-coated tablets are also an effective heartworm preventive. Milbemycin oxime and praziquantel are the active ingredients of the tablets. The first one disrupts nerve transmissions in invertebrates and thus destroys heartworm larvae, hookworm and roundworm. Praziquantel disintegrates and kills tapeworm by causing muscle spasm. The combined effect of both ingredients results in killing and controlling intestinal worms and preventing heartworms. The minimum dosage is 2mg milbemycin oxime and 5 mg praziquantel per kilogram of bodyweight. Check dosage table for details. 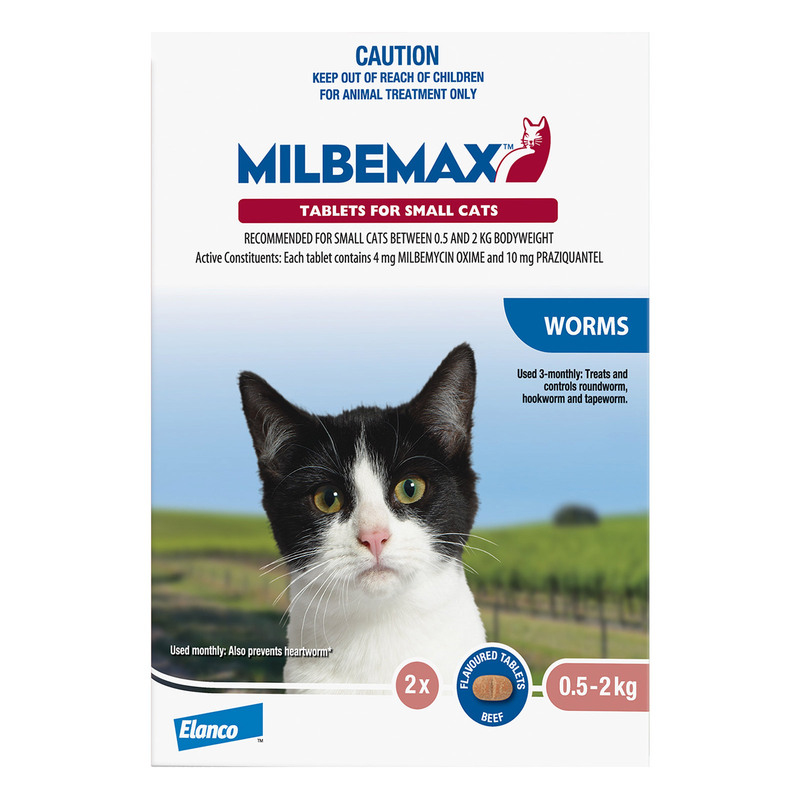 For treating intestinal worms, give accurate dosage of Milbemax for small cats at 6, 8 and 12 weeks of age. After this, repeat at every 3 months. Give Milbemax for cats to cats weighing over 2 kg at an interval of 3 months. Treat nursing queens at the same time as their kittens. For heartworm prevention, get your pet tested for existing heartworm infection. If the test is negative then administer one tablet per month preferably on the same date. On missing any dosage, treat immediately and resume monthly dosing. Note: It is safe for breeding cats, pregnant and lactating queens. It is considered highly safe for cats going through any of the reproductive stages. Side effects are rare but may occur to sensitive pets. If you observe any abnormal behaviour after administering the tablet then consult a vet immediately. Eliminates worm infections quickly. My dog had one and got rid of it within a day.